Just four days after publishing an exclusive story which uncovered that the amount of parking provided at the Mercer Commons development exceeded city mandates and added approximately $4.25 million to the project cost, officials from the Cincinnati Center City Development Corporation (3CDC) contacted UrbanCincy to offer more information surrounding the Mercer Commons Garage. Many commentors on our previous story defended 3CDC and claimed that such parking provisions at the Mercer Commons Garage would allow for less parking at future developments. Adam Gelter, 3CDC’s Vice President of Development, echoed these thoughts and stated that future developments would in fact utilize the parking garage, although only some of those projects have been financed, and even fewer approved for zoning variances by the City of Cincinnati. 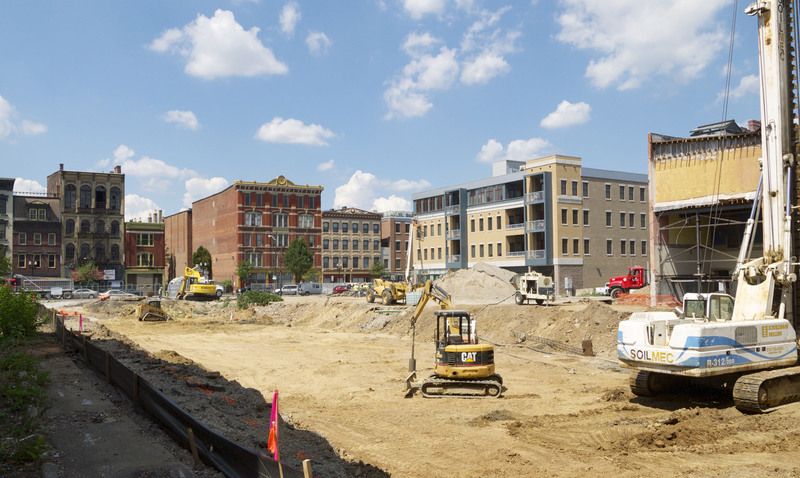 Work at the Mercer Commons construction site in August 2012. Photograph by Travis Estell for UrbanCincy. In particular, Gelter, stated that the 359-space Mercer Commons Garage allows for one parking space at every unit within that development, but that those living at Mercer Commons would not be required to purchase a space. This, 3CDC asserts, will allow for the parking garage to be utilized more efficiently. The debate becomes even more nuanced when the status of Over-the-Rhine’s historic district designation and ongoing comeback as a desirable neighborhood are taken into account. In addition to the Mercer Commons development, 3CDC officials say that they are planning a 30- to 40-unit residential development at the parking lot where Smitty’s once stood. Furthermore, 3CDC expects the office tenant at the Paint Building to require 25 spaces, another 15 to 20 spaces at the former Boss Cox building, and potentially 50 spaces for office users at Cintrifuse. Furthermore, project officials say surrounding restaurants could use additional parking for their customers. To that end, Gelter explained that only six parking spaces at the Fountain Square Garage are reserved at any given time for its 250 monthly pass holders. Rendering of the $53.5 million Mercer Commons development in historic Over-the-Rhine. Image provided. The goal would be to reduce the number of surface parking lots needed to serve new developments throughout historic Over-the-Rhine, but 3CDC officials say that what has already been put in place will probably be difficult to undo. Gelter went on to say that one potential option would be to keep the Gateway Garage open to the public. Just over one year ago Kroger purchased the 950-space parking garage from the City of Cincinnati for $4.5 million, and currently experiences low usage rates outside of workday hours. When it comes down to it, however, it appears as though the status quo for providing parking within the urban core will continue regardless of what policies come out of City Hall. The first phase of construction at Mercer Commons is currently underway, and is expected to be complete by March 2013. Two additional phases of work are planned to follow.